We have announced two call outs for artists to produce exciting work for the Library of Birmingham opening season, curated by Capsule. We are looking for artists/organisations to take on week long residencies within an exciting space designed by Studio Myerscough (draft image above), and we will also commission an artist/illustrator to create new work to sit in the new Children’s Library. Artwork: We require a series of illustrations – of characters and their environment – that will be produced as large-scale soft toys/furniture and as vinyl illustrations on specified walls and floor. It is expected that children will be able to develop their own narratives and play with the characters in both informal and workshop contexts. Schools Workshops: Artists will be encouraged to research or test their ideas in consultation with local children through the Library of Birmingham’s established relationship with local schools (4 – 11 yrs). Where community engagement is not normally part of the artist’s practice, Capsule will work with them to realise appropriate workshops and activity, bringing in additional personnel as required. Click through for further information, including how to apply, fee and criteria. 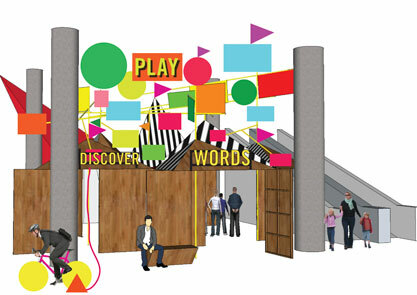 As part of the Discovery Season Capsule and Library of Birmingham are inviting artists, creative practitioners and arts organisations to propose ideas for week-long residencies in the ‘Playground of Discovery’: an exciting and dynamic structure designed by Studio Myerscough to be situated in the foyer. Residencies will need to offer free drop-in activity for visitors to the Library of Birmingham around the central principle of Discovery. The structure will be able to accommodate between 10- 20 people. All residencies must engage with visitors to Library of Birmingham and offer opportunities for them to actively participate. Unless otherwise stated, you will be required to work with all ages.